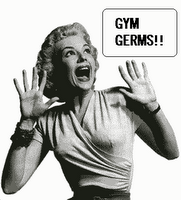 It’s a place designed to help you get healthy, but ironically the gym can also make you sick. A recent hygiene study of a family fitness center in Ohio analyzed more than 100 samples from various locations in the gym and found that the most contaminated surfaces were door handles, shower floors, free weight benches, and dumbbells. Tests done on three separate days found “extremely high” levels of germs on these surfaces. The study, funded by Coverall, a cleaning-product company, also found worrisome levels of germs on the front desk check-in area, water fountains, and alarmingly, the gym’s childcare area.